Is there anything more annoying than doing research, finding the right player and the right matchup, and then watching it unfold on the screen pretty much exactly how you said it would…only to watch the receiver drop a 40 yards touchdown pass? That happened to us last week since highlighted Tyrell Williams of the Chargers. He did everything right and had an easy touchdown and he dropped the ball! The Quant Edge did a great job of providing the tools that pointed us to him and he just failed everyone. Williams would have made us 2 for 4 on our players last week, as Ted Ginn hit for a nice day in the highest-scoring game of the week. Ginn won’t be in the article today, but I don’t hate playing him again this upcoming week. Unfortunately, Devin Funchess and David Njoku didn’t fare so well. That’s going to happen sometimes as this article is designed to find some riskier plays but hopefully, we’ll hit more than 25 percent every week. Let’s get to Week 2, complete with players catching the ball this time! 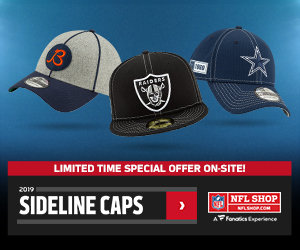 Gridiron Experts has teamed up with the Quant Edge in 2018 to provide our staff with exclusive tools and data to enhance the quality of their articles and to provide our readers with insider info. 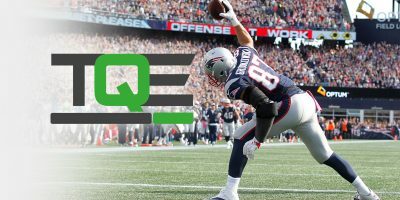 If you’re interested in learning more about TQE, read our review of The Quant Edge and how their amazing tools can help you win in DFS or in your fantasy leagues. If you’re interested in signing up, use our Promo Code “Grid10” to save you $10. Check out The Quant Edge Today! Maybe this one is a little obvious in the value range but sometimes the obvious play can be one of the better plays. 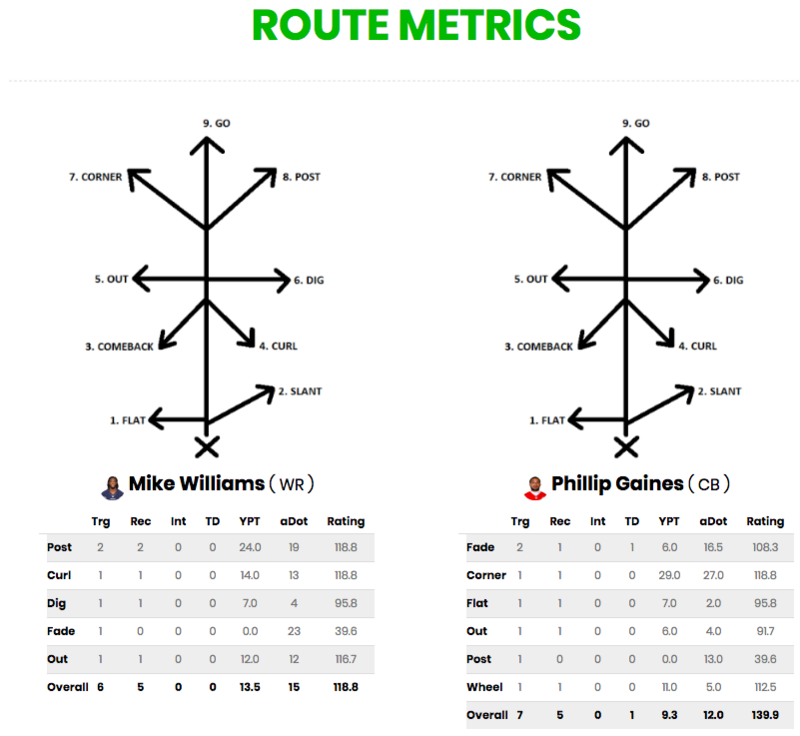 At the same time, now that Dante Pettis is going to be very chalky in San Francisco, Ryan Grant may well slide under the radar. Grant is one of the newer pieces of the Colts offense but he could yet prove to be a very important piece. The Colts are only going to go as far asthe right arm of quarterback Andrew Luck can take them. For the offense to really hit on all cylinders, they need someone other than T.Y. Hilton and Jack Doyle to be a reliable target. That’s where Grant is going to come in and Indy had him play 79 percent of snaps this past week and he saw nine targets, which was a solid 17 percent. 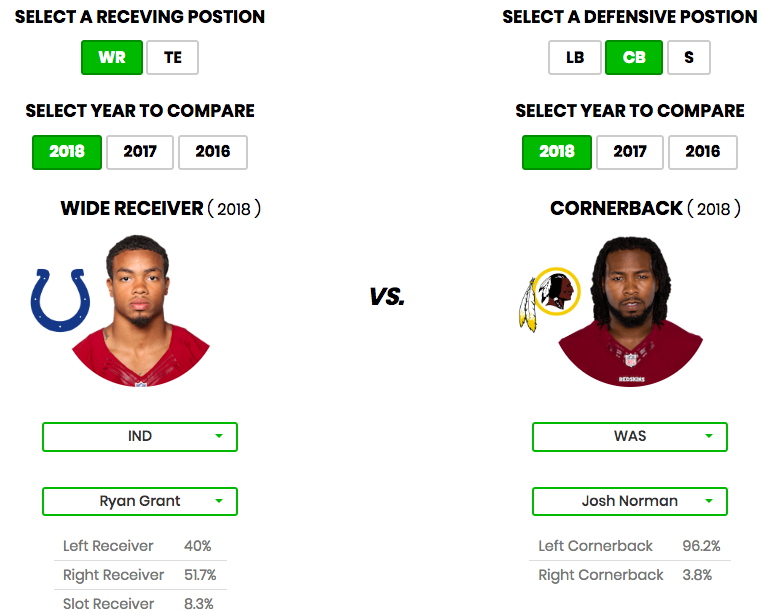 The fear might be how much Grant could be lined up on Josh Norman, and that is fair. Based on the alignment from last week from both teams, Grant is going to see Norman a fair amount. Here’s the nice thing – there’s still 50 percent of the snaps that Grant will not be matched up against Norman and when that happens, T.Y. Hilton is likely to be dealing with him. Grant would see Quinton Dunbar in that scenario and could wind up being a primary target on those plays. There are plenty of wide receivers in the bargain range and Grant is one that’s in consideration. Grant is a very unknown quantity at this point but what we do know is the Dolphins saw over 26 percent of their targets from 2017 get traded to Cleveland when they dealt Jarvis Landry. While Miami brought in Albert Wilson and Danny Amendola and they did play more snaps than Grant, he saw 7 targets on his 31 snaps. They seemingly want to get him the ball and while his 5 receptions for 38 yards doesn’t look impressive, his aDOT was spiked up at 16.6 yards, higher than Kenny Stills. Miami moved him around the formation a lot but he would see Trumaine Johnson on the majority of plays. 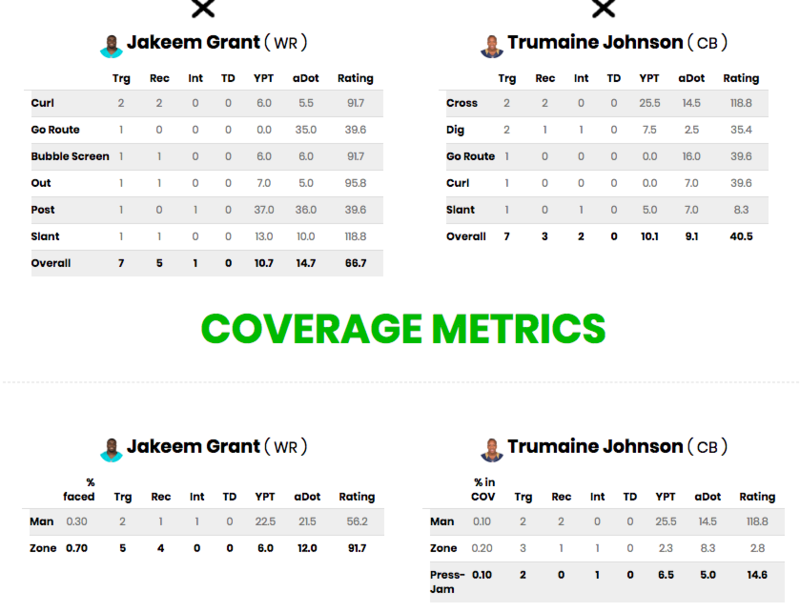 These metrics are skewed since it’s only one game and Johnson’s rating in zone is fueled by his interceptions. Johnson was in zone coverage enough that Grant could find that spot on the field to do some work. The price point is still so low on Grant that he really only needs 12 points to hit 3x value and he lets you fit a bunch of other studs into your lineup this week. The Jets gave up the seventh most passing yards last week and that was with intercepting Matthew Stafford four times. If Grant connects on one of the deeper balls they tried last week, he could pay off in spectacular fashion. I’m going to try my hand at another Chargers receiver this week but part of this is injury related. Travis Benjamin has not practiced all week and is considered “questionable” but that seems optimistic at best. Williams only played 54 percent of the snaps last week but that would definitely increase if Benjamin is out. 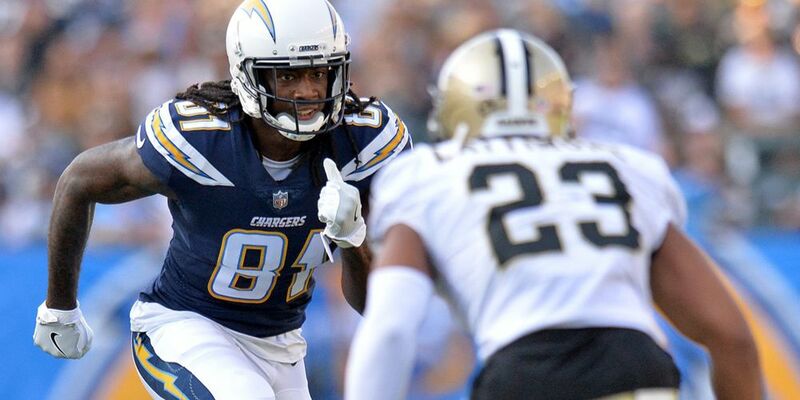 Keenan Allen and Melvin Gordon are going to dominate most of the offensive touches but Williams saw six targets last week, which was tied for second among receivers last week. He produced with 80+ yards so the Chargers had to like what they saw after a difficult rookie season. The even better news for Williams in this spot is he will avoid Tre’Davious White for the most part, lining up against Philip Gaines. He was absolutely torched by the Ravens last week and Williams has three inches and around 10 pounds on Gaines so this shapes up as a great spot to score his first NFL touchdown this week. I’m typically not a fan of trying to use players from teams coming from the West Coast for a 1 pm start but this might be a good game to make an exception. The Buffalo Bills look dreadful and there’s a reasonable chance they could see some short fields if Bills rookie quarterback Josh Allen makes a few mistakes. 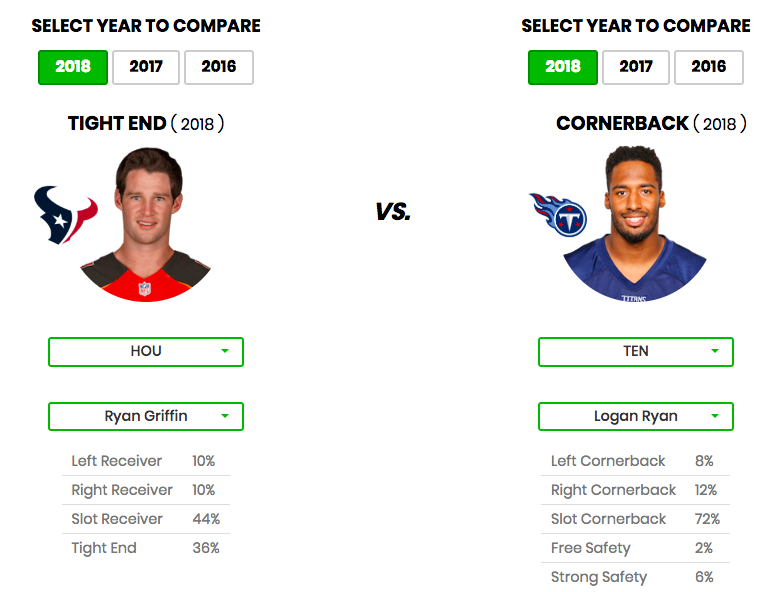 I’ll be upfront on this one – it’s going to be considered a bit of a reach since Griffin is sitting on as many fantasy points as you or me right now. 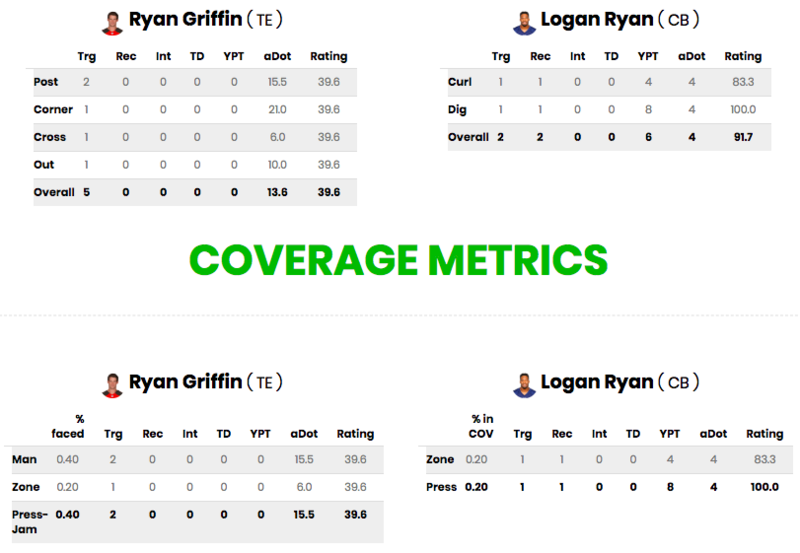 Despite seeing five targets, Griffin came up with a goose egg in Week 1 but the metrics look a little more promising. First, the Titans were mediocre against tight ends last year as they gave up 11.8 points per game. Second, Griffin not only played on 85 percent of snaps, but he saw four red zone targets last week. That was over a 40 percent market share and the usage was interesting too. Houston lined him up in the slot fairly often and that could be an advantage against corner Logan Ryan. We see the usage but Ryan didn’t fare too well in coverage last week either. George Kittle is likely going to be very chalky and Ricky Seals-Jones could draw some ownership in tournaments. Griffin also could be in a slightly more crowded offense since Will Fuller is set to make his return to the lineup but all we need from Griffin is a red zone target to connect. He’s a very solid way to get off the tight end chalk this week, albeit a risky one. Bets of luck in your Week 2 contests and we’ll be back with The Quant Edge in Week 3!